This is fiction. It was only written with the intent to promote thinking and discussion on the scrap short term tourist visas to Ghana issue. Join comment and share the FB group and sign the petition. 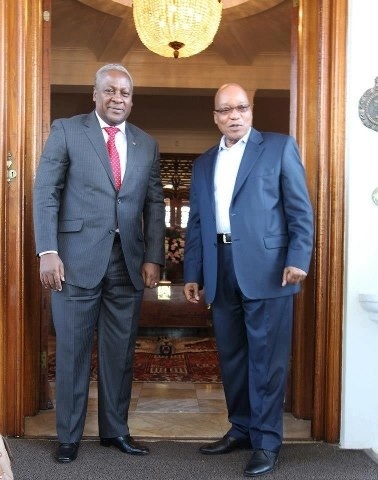 President Mahama (PM): Hello, Jacob, thank you for hosting me and my delegation here in Pretoria. President Zuma (PZ): You’re welcome, John. Say I read your book My First Coup D’Etat. It got you into a little hot water I read. I’m thinking of publishing my own memoir. Could I have an introduction to Andrew Solomon. It won’t pose any problems for me here in South Africa. PZ: Sure, how about tourism..Did you know that 1 in 12 people are supported by tourism in South Africa? What about in Ghana? PM: Hmm, I’ll have to get back to you on that one. PM: Wow, how do you do it? PZ: Well, John, it’s hard work and we do invest a lot into the sector. You know the ole saying, “No pain, no gain.” But talking specifics, we have policies in place to facilitate easy entry for tourists to S.A. So important, John. And then, we have entered into reciprocal agreements with certain counties, like Benin. Citizens of both countries can enter without acquiring a VISA. PZ: Not so fast John, my father-in-law was just telling me about all the hoops he has to jump through to get a short term tourist VISA to Ghana. In fact, this will be his second time to Ghana and he told me it is harder now to get the VISA than a few years ago. PZ: and another thing we do is market S.A. aggressively. You must have seen our CNN campaign. It cost a fortune, John. But the returns…oh, la, la! PM: Which brings me to the real reason, why I’m here…S.A. assistance for Ghanaian infrastructure projects. PZ: Hmmm, it all depends on tourism revenues, John, ours and hopefully yours. And just before you go, I read in your book you are working on a second book…any ideas for a title. INVITATION WOULD YOU LIKE TO CONTINUE THE CONVERSATION…COMMENT BELOW AND I’LL PUT IT ON THE SCRAP SHORT TERM TOURISM VISA TO GHANA FB GROUP PAGE. Hope you enjoyed this…I look forward to your feedback. Continuing the “conversation” that took place after lunch. PZ: Say John, didn’t the British fight the Ashanti around about the same time as our own Boer war? PM: Er, I think so. PZ: I am sure it was. 1899-1902. Did you know that last year more than 70,000 visitors followed the Boer War trail in the Orange Free State? I mean those crazy foreigners came just to see where those wars took place. I quite like reading about Yaa Asantewaa myself. She taught those British a thing or too. Next time I am in Ghana, I think I’ll take a tour of her battle fields. PM: Er, er, hmm. Jacob, I don’t think we have anything like that! PZ: What? World famous warrior Queen like her and nothing for people to see? People pay good money for that sort of thing, John. PZ: Ah, well. Next time I visit I will just relax and watch the whales go by along your west coast. Too crowded here in South Africa. You know close to 500,000 people visit our shores to maybe catch a glimpse of great white sharks and whales. John, they are paying up to $100 each. The tax we get from that alone allows us to remove visa restrictions for short visitors! PM: We have whales?? Really? PZ: I really am surprised at you, John! Your ministers are letting you down. Don’t worry. I am sure you superstar footballers are advertising Ghana for though. Shame about THAT penalty, but Ghana got so much free positive publicity from your boys. Did you know that we had a massive increase in people wanting to visit Ghana after the World Cup, but many lost interest because the cumbersome visa process? Say John, isn’t Ghana the home of Kente? PM: (Puffed up with pride) of it is, Jacob. We have some special villages that specialises in its production in the Ashanti and Volta regions. There are about 5 hours from Accra by road. PZ: FIVE HOURS? Isn’t there an international airport in Ashanti to reduce travel time? John, vacationers work hard for their free time; they don’t want to waste it in traffic or road works! Guess what John? Ghana has a lower crime rate, lower prevalence of HIV, shorter flight time, a burgeoning economy, better educational system but we earn more tourism dollars than you. Think about it!